Timothy Adam Hudson (born July 14, 1975) is an American former professional baseball pitcher of Major League Baseball (MLB). After spending his college years at Chattahoochee Valley Community College and Auburn University, Hudson played in the major leagues for the Oakland Athletics (1999–2004), the Atlanta Braves (2005–13) and the San Francisco Giants (2014–15). With the Giants, he won the 2014 World Series over the Kansas City Royals, giving him his only world title. During his 17-season career, Hudson established himself as one of baseball's most consistent pitchers and until 2014 had never had a season where he suffered more losses than wins. Hudson was also named an All-Star four times: twice with Oakland, once with Atlanta, and once with San Francisco. Before retiring in 2015, Hudson was the winningest active Major League pitcher, as well as one of four active pitchers with at least 200 career wins. With a win against the Oakland A's on July 26, 2015, he has won a game against every team in the majors, the 15th pitcher to do so. Hudson is one of twenty-one pitchers in Major League history to win at least 200 games, strikeout 2,000 batters and have a win-loss percentage above 0.600. Of those twenty-one, fourteen are in the National Baseball Hall of Fame. Hudson attended Glenwood School in Phenix City, Alabama where in his senior season he led the team to the 1993 AISA state championship. He finished his high school career with a 12–1 record and a 1.78 ERA. Despite his record, Hudson was considered undersized by scouts at 6'0" tall and 160 pounds and was not drafted nor was he offered a scholarship to a major college. Hudson decided to attend a local two-year college, Chattahoochee Valley Community College (CVCC). In 1994, his freshman year at CVCC, he earned First-team All American honors while leading his team to the AJCCC Division II championship. He also led CVCC team in batting average (.385), home runs (9), RBI (42), wins (10–2), strikeouts (76), and was second on the team with a 2.76 ERA. As a sophomore, he was named Second-team All American and set a school and conference record with 117 strikeouts which also led the nation. As a hitter, Hudson batted .345 with 5 home runs, and 29 RBI. His sophomore season ERA of 1.95 was the team and conference best. Prior to his junior year, Hudson transferred to Auburn University where he would play two seasons. He is still at or near the top of many school records. In 1997, he played all 65 games for the Tigers while both pitching and playing outfield. That season, he hit .396 with 18 home runs and 95 RBI. As a pitcher, he finished 15–2 with a 2.97 ERA to earn SEC Player of the Year and consensus All-American honors. Tim was the first player to be named First Team All-SEC at two positions (P,OF) in the same year. He was drafted by the Oakland Athletics in the 6th round of the 1997 amateur draft. Hudson was drafted by the Oakland Athletics twice, in the 35th round of the 1994 MLB Draft and again in the 6th round of the 1997 MLB draft, signing in 1997. 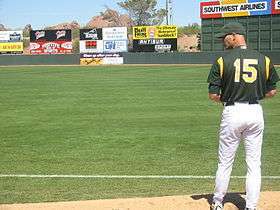 He made his Major League debut with a five inning start on June 8, 1999 against the San Diego Padres, where he allowed three earned runs in a game the Athletics eventually lost 5–3. He recorded his first career win in his next start, on June 13 against the Los Angeles Dodgers. He allowed only one run in seven innings of the 9–3 victory. In his rookie season, Hudson had an 11–2 mark and finished 5th in the AL Rookie of the Year vote. He became a member of Oakland's so-called "Big Three", along with left-handed pitchers Mark Mulder and Barry Zito. In 2000, he posted a career-high 20 victories along with a 4.14 ERA for Oakland. Over the course of the next three seasons, Hudson's records were 18-9 in 2001, 15–9 in 2002 and 16–7 in 2003 with a career low 2.70 ERA. In 2004, Hudson failed to pitch 30 games due to injury. He went 12–6 in 27 starts. Hudson's record while with the A's was 92 wins, 39 losses, and an ERA of 3.30. Before the 2005 season, Hudson was traded to the Atlanta Braves in exchange for Charles Thomas, Dan Meyer and Juan Cruz. On August 6, 2005, Hudson won his 100th career game, defeating the St. Louis Cardinals 8–1. In January 2006, Hudson was named to the Team USA roster for the 2006 World Baseball Classic. His second season with the Braves was disappointing. He posted career-highs in losses (12) and ERA (4.86) in 2006. He returned to his earlier form in 2007 however, finishing with a 16–10 record and a 3.33 ERA. He was in the midst of a 9-game winning streak, the second of his career, at one point in the season. Hudson struck out a career-high 12 batters on April 25 against the Florida Marlins. Hudson is one of only 7 ballplayers who pitched in the NL in 2007 who won at least 12 games in each year from 2004–07, the others being Carlos Zambrano, Greg Maddux, Roy Oswalt, Jason Marquis, Derek Lowe, and Jeff Suppan. On August 2, 2008, Hudson revealed that he would undergo Tommy John ligament transplant surgery on his pitching elbow, and missed the remainder of the 2008 season. He started the 2009 season on the 60-day DL, and did not play prior to the All Star break. On July 2, 2009, he threw a 90-pitch bullpen session and Atlanta Braves manager Bobby Cox said: "He's ready to go. ... He's really come along. He's got major-league stuff right now, his normal stuff." But Cox added that the Braves would not rush the timetable on Hudson's return, which was scheduled for mid- to late-August. Hudson's first minor-league rehab start was tentatively scheduled for July 19 at Class A Myrtle Beach. After completing several minor league rehab sessions, Hudson returned to the Atlanta Braves starting pitching rotation on September 1, 2009. He gave up only two runs and earned his first win of the 2009 season. On November 12, 2009, Hudson signed a $28 million, three-year extension with the Braves with a $9 million option for a fourth year. On August 28, 2010 against the Florida Marlins, Hudson set a career high in strikeouts with 13. On October 5, 2010, Hudson was awarded the 2010 NL Comeback Player of the Year award. On June 20, 2011, in Atlanta, Hudson hit his second career home run, a two-run home run which provided the only scoring of the game in a 2–0 victory over the Toronto Blue Jays. On the same day, he got his 1,600th strikeout in the top of the fifth inning against J. P. Arencibia. On July 15, 2011, Hudson was the winning pitcher in the Braves' 10,000th win in franchise history. Hudson went 16–7 with a 3.62 ERA in 2012. On October 30, 2012, Hudson had his $9 million option exercised by the Braves. On April 30, 2013, Hudson became the 113th major league pitcher to reach 200 wins, with an 8-1 victory over the Washington Nationals at Turner Field. Hudson went 7 innings, giving up only 3 hits and 1 run while recording 6 strikeouts and 2 walks. Hudson also went 2 for 3 at the plate with a double and a home run. On July 24, 2013, Hudson was pitching a 4-hit shutout against the New York Mets when Eric Young, Jr., who was trying to beat a throw to first base, accidentally stepped on Hudson's leg above the ankle. This resulted in an ankle fracture that ended Hudson's 2013 season. After the season, Hudson became a free agent. His record with the Braves was 113–72 with an ERA of 3.56. On November 18, 2013, Hudson agreed to a two-year, $23 million contract with the San Francisco Giants. Hudson set a franchise record by pitching 30 2/3 innings in the season before issuing a walk. The record was snapped on April 25 when he walked Carlos Santana. In his first year with the Giants, he was selected to participate in the All-Star Game. Accomplishing this feat, he has made the All-Star team at least once with every team he has pitched for. On August 27, 2014 in a 4–2 team win over the Colorado Rockies at AT&T Park, Hudson recorded his 2,000th career strikeout. Hudson started game 2 of the 2014 NLDS, a game that went 18 innings, Hudson also started the only other postseason game to go longer than 16 innings while on the Braves in 2005. On October 29, Hudson became the oldest pitcher to start Game 7 of the World Series. The Giants went on to win the game, 3–2, and the series, 4–3, over the Kansas City Royals, giving Hudson the first and only World Series ring of his 16-year career. Prior to the 2015 season, Hudson stated it would likely be his last. Following a 4-3 win against the Oakland Athletics on July 26, 2015, Hudson became the 15th pitcher in MLB history to register at least one win against all 30 current teams. On September 26, 2015, Hudson started against Zito and the Athletics in a matchup that was arranged as a tribute to the A's "Big Three" of the early 2000s. Both pitchers received lengthy standing ovations from the sold-out Oakland Coliseum crowd (which included the third Big Three member, Mulder) upon leaving the game. Hudson is a sinkerballer, using that pitch about half the time and at a speed of 87-91 mph. His next-most used pitch is a cutter at 84–87. He expands his repertoire to left-handers with a curveball (75-77) and splitter (78-81). He also has a four-seam fastball (88-91 mph). His favored pitch with 2 strikes to right-handed hitters is his cutter, while he stays with the sinker to lefties. Received the Roberto Clemente Award nomination for the second year in a row on September 7, 2007. The award is given every year to a Major League Baseball player who gives outstanding performances both on the field and in the community. Pitched three complete-game one-hitters: August 28, 2000, against the Chicago White Sox; May 1, 2006, against the Colorado Rockies; and May 4, 2011 against the Milwaukee Brewers. On April 30, 2013, Hudson won his 200th career game, pitching 7 innings of 1 run ball against the Washington Nationals. On July 26, 2015, Hudson became 15th pitcher to record a win against all 30 major-league clubs. Hudson is married to the former Kim Bruner, whom he met while a student at Auburn. The couple have two daughters, Kennedie and Tess, and one son, Kade. They currently live in Auburn, Alabama. Hudson is a Christian. Hudson has spoken about his faith saying, "It's been one of those things, where anybody that's played a sport at the professional level there's always a lot of challenges. And the one thing that's always been a constant for me is Jesus Christ and my faith ... And not only that, but just being an example for other players, my teammates, my friends from home. You know I think it's one of those things where you need to be a beacon of light and just shine on people." On April 29, 2007, both Hudson's grandmother and St. Louis Cardinals relief pitcher Josh Hancock, his college teammate at Auburn, died. He drew his grandmother's initials on the pitcher's mound before his next start, and wore them on his spikes. He also sewed Hancock's initials (JH) on his jersey. He pitched 8 innings, giving up 2 earned runs against the Philadelphia Phillies. He did not get a decision, but the Braves ultimately won, 5–2. 1 2 Chad Thornburg, "Hudson joins small club with win over A's". MLB.com, retrieved July 27, 2015. 1 2 3 "ACCC Hall of Fame – Timothy Adam Hudson 2001". Alabama Community College Conference. Archived from the original on February 6, 2012. Retrieved July 16, 2007. ↑ DiMeglio, Steve (March 28, 2001). "A Tale of Two Hudsons". USA Today. Retrieved July 16, 2007. ↑ "Hudson, Braves agree to $28M deal". ESPN. Associated Press. November 12, 2009. Retrieved November 18, 2009. ↑ "Hudson, Liriano win comeback player awards". Google. Associated Press. October 5, 2010. Retrieved October 5, 2010. ↑ David O'Brien (June 20, 2011). "Hudson pitches, slugs Braves to 2–0 win". The Atlanta Journal-Constitution. Retrieved June 21, 2011. ↑ Nicholson-Smith, Ben (October 30, 2012). "Braves Exercise Three 2013 Options". MLB Trade Rumors. ↑ "espn.com game recap". espn.com. Retrieved 2013-04-30. ↑ Cotillo, Chris (November 18, 2013). "Giants to sign Tim Hudson to two-year, $23 million contract". MLB Daily Dish. ↑ Haft, Chris (November 18, 2013). "Giants add veteran Hudson to rotation". MLb.com. Retrieved November 19, 2013. ↑ Haft, Chris. "Giants open Interleague series on a positive note". Retrieved April 26, 2014. ↑ "Tim Hudson lining up retirement". ESPN. November 19, 2014. ↑ "Game is tribute to Zito, Hudson". Retrieved September 27, 2015. ↑ "PITCHf/x Player Card: Tim Hudson". Brooks Baseball. Retrieved 26 May 2012. ↑ "Atlanta Braves Starter Tim Hudson Takes The Mound". 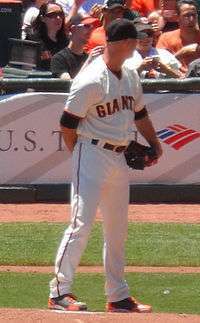 Wikimedia Commons has media related to Tim Hudson.